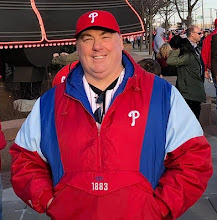 Weather permitting, at 3:05pm on Monday, April 6th, the Philadelphia Phillies will take the field to open the 2015 MLB regular season with an Interleague game against the Boston Red Sox. The spring training process of workouts and Grapefruit League games is beginning to sort out the players as the coaching staff and management will cut down to a final 25-man roster for the Opening Day ball club. Over the past week, the Phils shipped out a number of players to minor league camp, allowing those players to get in more regular playing appearances and more focused instruction from the minor league coaching staff as they continue to develop. The reassignment of those players has begun the focus at the major league level on the final makeup of that 25-man roster. A number of the roster places are, health-permitting, already determined. But a handful remain up for grabs as the team enters it's final two weeks in Clearwater. 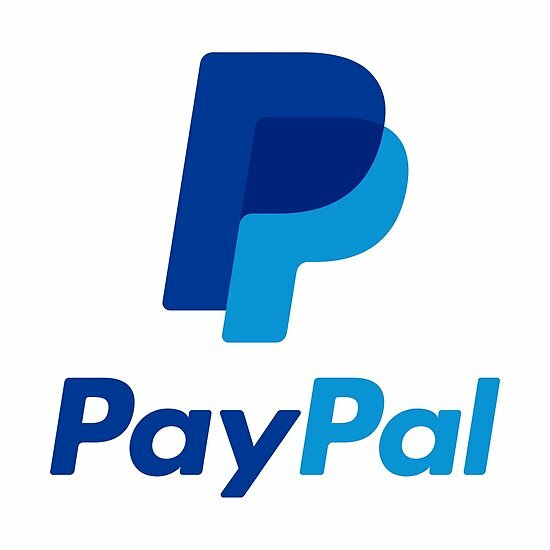 The 15 players who have roster spots sewn up include 7 position players and 8 pitchers: Ryan Howard, Chase Utley, Freddy Galvis, Cody Asche, Carlos Ruiz, Ben Revere, Grady Sizemore, Cole Hamels, Aaron Harang, Jerome Williams, David Buchanan, Jonathan Papelbon, Ken Giles, Jake Diekman, and Justin De Fratus. In addition to those, the following four (4) players would appear to have the team made, barring some unforeseen developments: Cesar Hernandez, Cameron Rupp, and Rule 5 picks Odubel Herrera and Andy Oliver. That would leave a half-dozen spots up for grabs over these last two weeks. Some of those spots will be determined by injuries. In fact, some of the roster decisions being assumed here already include injuries built into them. For instance, everyone knows that Cliff Lee is done, and that Chad Billingsley will not be ready and will begin on the DL. Also, outfielder Domonic Brown is injured, and this evaluation assumes he will begin the season on the DL. With those situations factored into the roster equation, here is how I see the final battles shaping up. The Phillies are likely to keep 2-3 more arms at the majors level to start the season. 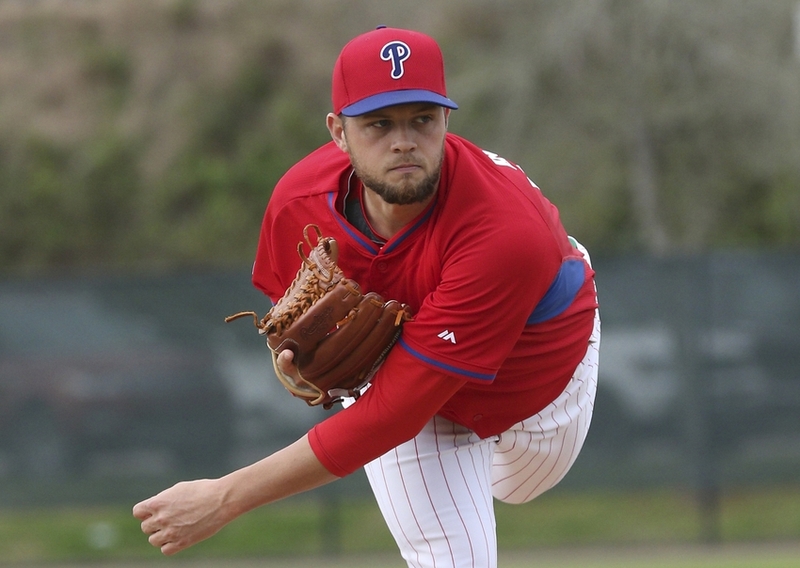 If there is another starter needed due to injury, or if the Phils simply decide to keep him as a long or alternate option, then veteran righty Kevin Slowey has a good shot. The other possibility for that role would be Miguel Alfredo Gonzalez. Frankly, Slowey has outpitched MAG, and deserves the spot on merit. Merit doesn't always win out, as the Phils have a larger financial investment in the Cuban. Unless there are a couple of rotation injuries before the opener, only one of these two may make the cut. A trio of pitchers may be battling for a shot in the major league bullpen: Jeanmar Gomez, Luis Garcia and Phillippe Aumont. The 28-year old Garcia has done nothing to lose a spot. He has pitched seven innings across seven games, has three Saves, and has allowed just three hits, with a 7/1 K:BB ratio. The 27-year old Gomez is the most experienced of the group, with parts of the last five seasons spent in the big leagues with Cleveland and Pittsburgh, including 46 starts and 74 relief appearances. He has a 1.35 ERA this spring, but has allowed eight hits across six innings. Aumont is out of minor league options, meaning that he would have to clear waivers in order to be sent to the minor leagues. He carries a hefty 4.50 ERA, but has pitched well in general. 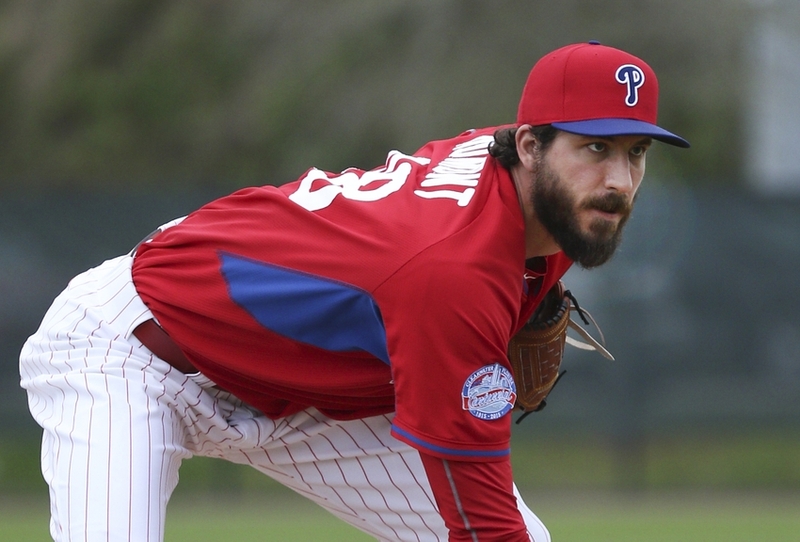 In six innings across five games, Aumont has allowed eight hits with a 7/1 K:BB ratio. His problem? Three longballs given up. If the nine pitchers identified as having Opening Day roster spots hold up as healthy, and assuming no trades (Hamels/Papelbon), then it's likely just two of the five from among Gonzalez, Slowey, Gomez, Aumont, and Garcia make the team. With Hernandez out of minor league options and a good fielder, he would appear to have a spot sewn up. 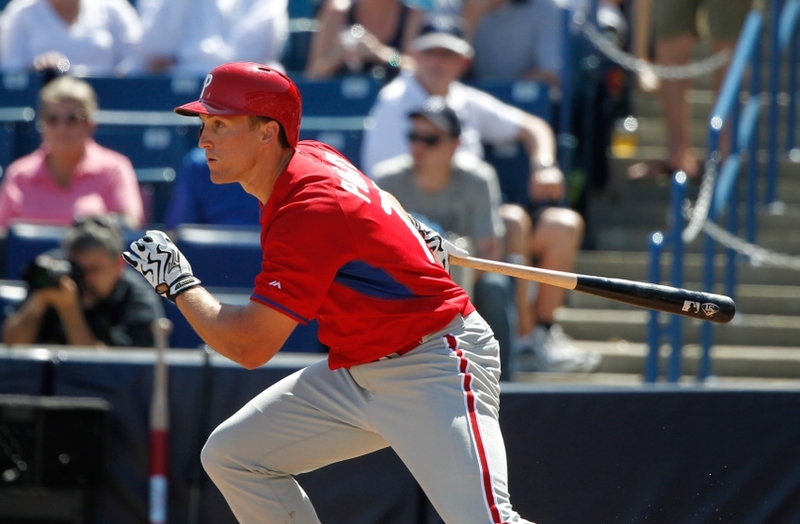 Still, the Phils are going to need another backup infielder, preferably one that can play several positions if needed. Soon-to-be 31-year old Andres Blanco has received a lot of playing time this spring, but he has not produced the most. To this point, the Phils have gotten more out of 28-year old Cord Phelps, who has played in parts of the last four MLB seasons with Cleveland and Baltimore. Phelps has been excellent this spring, hitting .345 with a .472 on-base percentage. Phelps has played 2nd, 3rd and shortstop in the majors. In the outfield, assuming Brown starts on the DL, and assuming the Phils do keep Rule 5 pick Herrera, a no-brainer at this point, we could see 3 of the 4 players from among Darin Ruf, Jeff Francoeur, Brian Bogusevic, and Jordan Danks make the team. If all the players mentioned here do hold up as healthy, and none are traded, a final actual decision may come down to whether or not to keep one of the outfielders or one of the pitchers. 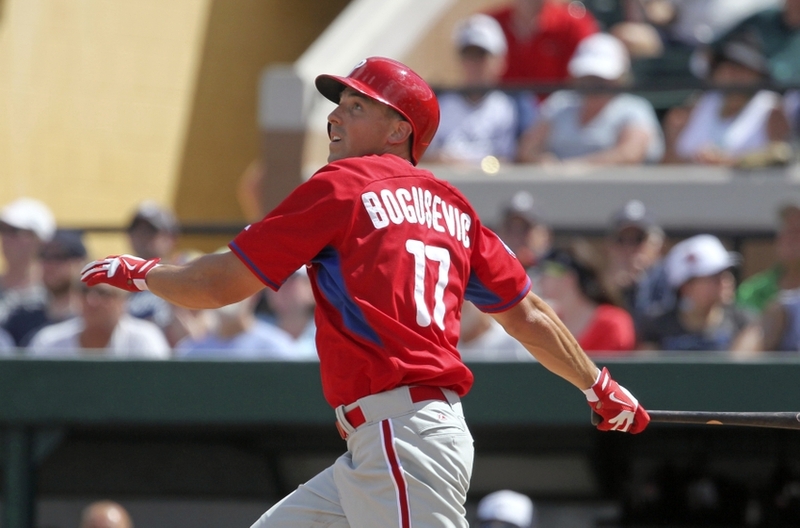 Do the Phillies go with 14 position players and 11 arms, or 13 and 12, to open the season? Just one of many questions that will be answered in less than two weeks. Ryne Sandberg on the Early Hot Seat?